Where can I find the order of go/ride times for events? The rider times will be available the evening before the competition on our website. Click here to view the page. (You must scroll down to the event you want and click the “bell” symbol to view). Where can I find the live results of events? Live results can be found on our website. Click here to view the page. (You must scroll down to the event you want and click the “ribbon” symbol to view). Yes, FEI TV is streaming every event to subscribers. Click here to login. What is the broadcast schedule? Click here to learn more about the broadcasting schedule. Who is competing at the WEG? Click here for the complete list of nominated entries. Is there a WEG app? There is not an official app for WEG, but many updates will be made regularly to the Tryon2018 website. But, our official fan engagement sponsor SAP offers an app for spectators to enjoy! Click here to learn more. Will parking be available at TIEC? What can I bring with me to the event? Click here to see what you can and cannot bring to WEG. What is the weather status based on Hurricane Florence? Click here for our updates on the weather. If you have a US cell phone, you can text WEG2018 to 888777 for traffic and emergency updates. When can I receive my tickets? You will receive electronic confirmation of your ticket reservation purchase immediately after making your purchase. You will receive your tickets via email on July 1st following seat assignments. Do I need to print my tickets out? You can print a copy of your tickets to show upon arrival or you can add them to your Apple wallet. To learn how to add tickets to your apple wallet click here. Do I get a receipt with my purchase? Yes, you will be emailed a receipt for your ticket purchase. If you do not have email, you will need to provide a mailing address. Will my seats be assigned or can I choose my seats? You are able to choose your individual session seats by clicking either “view able seats” under the product or “select seats” at check out. All multi-event passes are auto assigned based on best available seating. How are the weeks broken up into week one and week two? The week one pass covers Wednesday, September 12 through Sunday, September 16. Week two pass covers Tuesday, September 18 through Sunday, September 23. What time are the classes? Click here to view the official schedule. Click here to view the Official Schedule by Day and Time. What does the General Grounds Day Pass include? The General Grounds Day Pass includes access to the general grounds, vendor village and exhibitions/demonstrations, but does not grant access to any of the competitions. The General Grounds Day Pass is also included in ANY competition ticket. What does the All Sessions pass give me access to? An “All Sessions” pass gives access to all competitions for the duration of the package (Games, Week, Discipline, Day) and also includes admission to the venue, exhibitions, entertainment, dining and the World Equine Expo™. 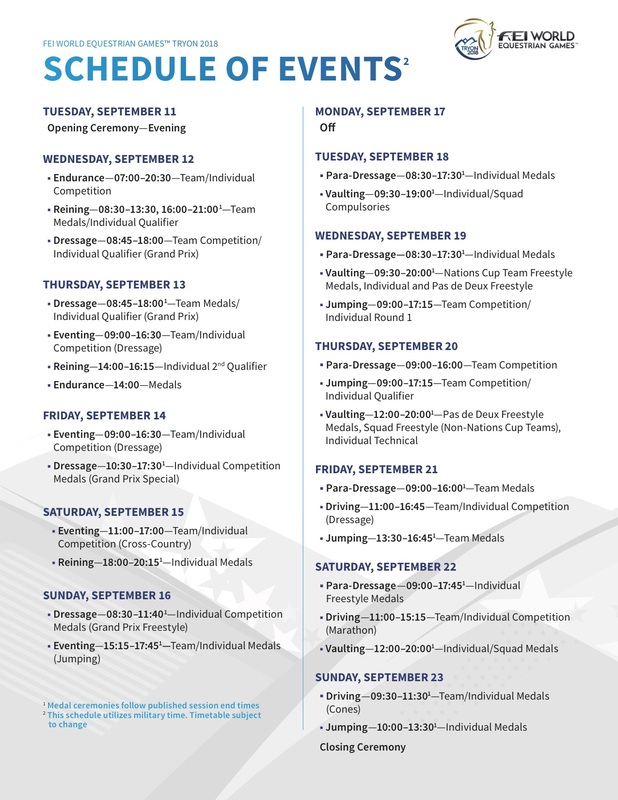 Please note that if you purchased an All Session Discipline pass, you will only have access to the competitions within that discipline. There are not children’s prices for competition events. However, there is a children’s price for General Grounds Pass. These are $10. Children 2-years-old and under will be admitted at no charge, but must sit on a ticketholder’s lap. If you want your child to have a seat, you will need to purchase a ticket for them. Why are there no tickets for sale on 9/17 and 9/18? September 17 is our transition day from week one to week two, as well as Community Day. Everyone who purchases a Day Pass will have access to view the competitions on that day. What is Community Day presented by Mars, Inc.? Community Day presented by Mars, Inc. is on September 17, 2018 and will take place within the World Equine Expo™ from 11am – 4pm. Admission and parking is FREE as a thank you to the regional North Carolina and South Carolina communities that have supported TIEC. For more info click here. North Carolina sales tax is 6.75%. What is the 8.5% service fee? Like most sporting and entertainment events, the service fee helps the ticketing agency facilitate and process ticket sales. Please email tickets@tryonweg.com should you encounter problems purchasing tickets. How can I purchase handicap seating? Indicate on your order that handicapped seating is needed. I didn’t receive a confirmation email. What do I do? Please email tickets@tryonweg.com with your 5 digit order number, and we will re-send to the email address you have provided. Do I get access to all vendors and exhibitions with my ticket, or do I need to purchase an additional general admission pass? Yes, venue admission is included in all tickets and grants access to vendors, exhibitions, entertainment, restaurants and the World Equine Expo™. Some All Day Session Passes are sold out. How will I see the events I want to see on those days? You can still purchase individual event tickets when they are released. Where can I find VIP and Hospitality information? VIP and Hospitality information is available HERE. Tickets purchased prior can be upsold to purchase these packages. No. Tickets are transferrable and can be upgraded but are non-refundable. Transferred tickets will remain under the original ticket holder’s name for security but will be shareable with secondary ticket holders following ticket distribution on July 1st. When I log in to my account, I don’t see my ticket order in there? You may have purchased tickets without creating an account. If you create an account after purchasing tickets, the two can be linked. Email tickets@tryonweg.com with the email associated with your account and ticket order number so that our team can rectify this for you. I’m having trouble logging in to my Tryon 2018 account! Please try resetting your password, and if you still experience trouble, email tickets@tryonweg.com. Can my dog come with me to WEG? NO PETS of any kind will be allowed on property during WEG. Service animals are welcome with proper documentation. How many people attend the Games? An average of 500,000 people attend the Games over the two-week period. TIEC is preparing for a daily attendance of 40,000 – 50,000 people. What is the potential impact of this event on this area? The 2014 Games in Normandy delivered over $400 million in economic impact, and attracted 984 athletes, 1,234 horses, 74 nations, 1,900 accredited media from 52 countries and 575,000 spectators. How do I promote my lodging facilities or vacation rental to potential WEG attendees? Tryon Resort has launched an online platform for the listing of vacation rentals. Listings can be viewed and added HERE. Will there be spectator accommodations available? Accommodations for the 2018 WEG are being managed by Connections Housing, a full-service sourcing, housing and event management company. With 30 years of experience serving events in a range of industries, Connections has two full-service, fully-owned call centers and will oversee all aspects of the housing process from contracting and room block management to reservations and post-event analysis. Accommodations are now open and can be booked by clicking here. Why can’t I stay on TIEC property? On site housing is reserved for athletes, judges, officials, and other WEG employees. How can I let my audience know about the WEG? We recommend creating a landing page on your website with a link to our Tryon2018.com website and sharing our FAQs. We will be sending out updates regularly and encourage you to share that with your audiences. How can I receive WEG updates? To receive our WEG updates, visit www.tryon2018.com and enter your email in the sign-up block on the right. How do I correctly use the event title? Am I allowed to use the WEG logo in my marketing? Please contact TIEC marketing department at media@tryonweg.com to request permission and branding guidelines for use of the WEG 2018 logo. What Are The FEI World Equestrian Games™? The FEI World Equestrian Games™ (WEG), which are administered by the Fédération Equestre Internationale (FEI), the worldwide governing body of equestrian sport, is the major international championship event for the eight core equestrian disciplines of show jumping, dressage and para-equestrian dressage, eventing, driving, endurance, vaulting and reining. The 2018 WEG has the potential to be the largest sporting event in North Carolina history with over $400 million dollars of projected economic impact and 500,000 spectators over the 13-day event in September 2018. What other cities have hosted the WEG? The inaugural FEI World Equestrian Games™ were hosted in Stockholm (SWE) in 1990. Since then the Games have been staged in The Hague (NED) in 1994, Rome (ITA) in 1998, Jerez (ESP) in 2002, and Aachen (GER) in 2006. The first Games to be organized outside Europe were the Alltech FEI World Equestrian Games™ in Kentucky (USA) 2010, where 57 countries were represented by 800 human athletes and their horses. The Games returned to Europe for the 2014 edition, the Alltech FEI World Equestrian Games™, which was held in Normandy (FRA). For more information, check out the FEI website here: http://inside.fei.org/fei/events/fei-weg. Media Accreditation is now available! Click here for more information about how to apply. For questions regarding media at the event, please contact our National or International Press Officers. National Media – Carly Weilminster at cweilminster@tryonweg.com or at (828) 863-1144.
International Media – Niki McEwen at niki@revolutionsports.co.uk or at 0044(0)203 176 0355.